FST is America’s longest running, side-by-side comparison of organic and chemical agriculture. It was established in 1981 to study what happens to soil health and agricultural productivity when transitioning from conventional to organic agriculture. While organic agriculture practices result in higher soil organic matter (SOM) contents and, in turn, higher nutrient- and water-supplying potential to crops, transition to organic farming typically involves a lag time of several years in which yields can suffer and input demands increase as rebuilding soil microbial communities compete with crops for nitrogen and other available nutrients (Simmons and Coleman, 2008). This was evident in the initial decline in yields at the FST during the first five years of transition. Beyond this period, the organic system rebounded and consistently produced corn and soybean yields that matched or surpassed the conventional system. Organic systems perform especially well during years of drought. During a 5-year period between 1988 and 1998 when total rainfall from April to August was less than 14 inches (compared to 20 inches in normal years), average organic corn yields were 31% greater than conventional system. This performance can be attributed to greater SOM in organic systems. 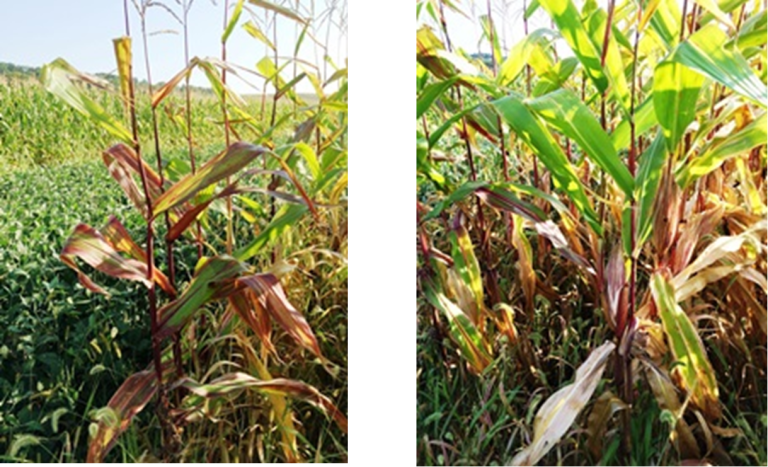 The pictures below, taken in September 2015 after a long dry spell, illustrates how corn can perform in the organic system compared to the conventional. Figure 1: From left to right; corn in no-till organic legume system and soybean and corn in no-till conventional system. Compared to the organic corn, the conventional corn are showing symptoms of nutrient deficiency (see close up Figures 2 and 3 below). Photos taken on 9/4/2015. Figures 2 & 3. A close-up of conventional corn from Figure 1 above with leaves showing signs of phosphorus deficiency. Figures 4 & 5. Left – corn in tilled organic legume system; and right corn in tilled conventional system – both taken on 9/15/2015. The above pictures illustrate the importance of healthy soil in growing healthy plants. Analysis of FST data over a 35 year period has established that soil health in the organic system has continued to increase over time while the conventional system has remained essentially unchanged (Figure 6). 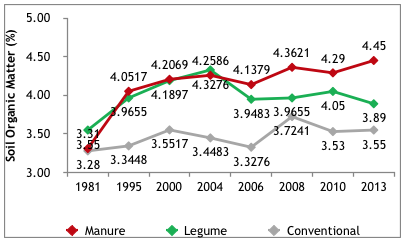 Soil organic matter in tilled manure organic systems increased from 3.3% in 1981 to about 4.5% in 2013 representing a net increase of 27% (Figure 6). In the conventional system, SOM changed from 3.3% to 3.6% – a net increase of only 8%. Other farms within Rodale Institute have reported SOM concentration of up to 6% (Moyer, Jeff; Duffield Ross; Personal Communication). Soil organic matter is very important in crop productivity as it increases both nutrient and water use efficiency. Studies have shown that SOM can hold up to 20 times its weight in water (Johnson et al., 2005). Hudson (1994) showed that “for each 1% increase in SOM, the available water holding capacity in the soil increased by 3.7%”. Addition of organic matter to the soil increases its water holding capacity mainly because organic matter increases soil macroaggregates, hence the number of micropores and macropores in the soil (Bot and Benites, 2005). Organic matter does this either by “gluing” soil particles together or creating favorable living conditions for soil microorganisms, which in turn can “glue” soil particles together through production of various organic compounds such as glomalin or by the action of fungal hyphae (Sylvia et al., 2005). Analysis of 35 years of data from the FST also found that the volume of water percolating through the soil was 15-20% greater in the organic systems than the conventional system. This water not only helps to recharge ground water but is also available for crop use, especially in periods of water stress. Greater corn and soybean yields in organic systems compared to conventional system during drought stress periods can be attributed to greater soil water content in the organic systems, coupled with greater season-long availability of essential plant nutrients. Bot, A., and J. Benites. 2005. The importance of soil organic matter key to drought-resistant soil and sustained crop production. Food and Agriculture Organization, Rome, Italy. Hudson, B. D. 1994. Soil organic matter and available water capacity. Journal of Soil and Water Conservation 49, 189–194. Johnson, J. M.-F., D. C. Reicosky, R. R. Allmaras, T. J. Sauer, R. T. Venterea, and C. J. Dell. 2005. Greenhouse gas contributions and mitigation potential of agriculture in the central USA. Soil and Tillage Research, 73-94. Simmons, B. L., and D. C. Coleman. 2008. Microbial community response to transition from conventional to conservation tillage in cotton fields. Applied Soil Ecology 40, 518-528. This material is based on work supported by the Wyncote Foundation.